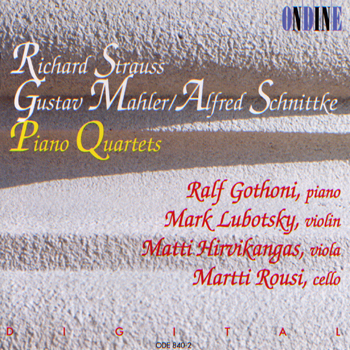 This CD features the two piano quartets by Richard Strauss (1884) and by Gustav Mahler (1876), the latter in its version completed by Alfred Schnittke in 1988. Both quartets by Strauss and Mahler were written during the composers' youth and bear a Brahmsian stamp. While Strauss's work has monumental proportions, Mahler's quartet remained a forgotten one-movement piece, with an additional fragment of a Scherzo surviving. in 1988, the Kuhmo Chamber Music Festival commissioned Russian composer Alfred Schnittke to complete the quartet, in particular the Scherzo. Finnish pianist Ralf Gothóni performs together with Mark Lubotsky on violin, Matti Hirvikangas on viola and Martti Rousi on cello.